HAFCAC campaigns in Hammersmith and Fulham to break the link between disabled people and poverty. Convinced Hammersmith and Fulham council to stop charging for home care services. This was huge! Hundreds of disabled and older people are better off, often by as much as £30-40 a week. Ongoing engagement with Hammersmith and Fulham council - ranges from the new Disabled People’s Commission to work on co-production, to developing the work encouraging disabled people to register to vote. Building the Disabled People’s Organisations network - still in its first year, we’re working to enable this network to grow in influence and confidence. Interested in helping us with our groundbreaking campaigning work? Please get in touch by clicking here. The Independent Living Fund (ILF) was shut permanently on 30 June 2015, having been closed to new applications since April 2010. The government transferred the funding to English local authorities initially for one year and then for another four years. However these grants were not ring-fenced so local authorities could spend the money on whatever they liked. This valuable report by Inclusion London looks at how London boroughs have used the money transferred from the ILF and what’s happening for the people who received them - by definition, people with the highest levels of support needs. In Hammersmith and Fulham through pro-active action by HAFCAC, Action on Disability and local direct payments recipients, the local authority ring-fenced the funds until 2020. But not all boroughs have done the same - “While a number of councils have made a decision to maintain pre- ILF closure levels of support, others have made substantial cuts…”. Hammersmith & Fulham Council is launching a Disabled People’s Commission as part of its drive to improve services and accessibility for all communities in the borough. Too often, disabled people are overlooked when councils are both designing and delivering services. 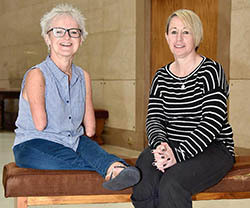 With the launch of its Disabled People’s Commission, H&F will look into the experiences of disabled people in the borough to help make positive changes to increase equality and inclusivity for all those who live in, work in and visit the borough. “I want Hammersmith & Fulham to become the most accessible and inclusive borough in London and this new Commission will help show us the way to deliver this vision. “As Commission Chair, I know that Tara Flood will draw on her excellent track record in disability campaigning. Tara is also a local resident, with vital first-hand experience of what life is like for disabled people in the borough. If you are a disabled person who lives or works in Hammersmith and Fulham and would like to be part of the new Commission then please contact Fawad Bhatti at fawad.bhatti@lbhf.gov.uk setting out some details about you, your experience and why you want to be on the Commission. It is hoped that we can launch the Commission with a first meeting in early September so please submit any expressions of interest in becoming a Commissioner to Fawad by Wednesday 31 August. The time commitment for Commissioners is expected to be two hourly meetings once a month in Hammersmith Town Hall or other venues around the borough for a period of some 9-10 months. The Commission is expected to complete its work and publish its findings and recommendations for action around May 2017. Source: (2016) H&F Council to launch Disabled People’s Commission [online] Available at <https://www.lbhf.gov.uk/articles/news/2016/08/hf-council-launch-disabled-people-s-commission> [Accessed September, 2016].